I was talking with someone about hat math recently and I wanted to put my thoughts down for other people curious about how easy it is to write your own hat patterns. The plain vanilla knitting between the cast on row and the crown decreases is a great canvas for expressing your own creativity. You can create your own lace motifs, use traditional fair isle peeries or icelandic snowflakes and add them between the cast on and bind off. 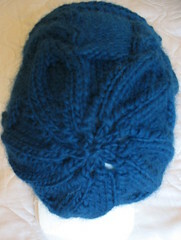 I think you’ll be surprised how easy it is to knit a hat of your own design and calculate the decreases in the crown of a hat. It’s pretty simple once you practice a few times and the method sets you free to knit hats exactly as you want. This discussion is broken up into two parts. The first part addresses the equation that relates Gauge, Finished Width and Stitches Cast on with a few examples to show how to use the equation. Use this method to determine what number of stitches to cast on using your favorite needles and yarn. Use the second discussion after you’ve calculated the number of stitches cast on. It goes over the actual hat decreases with examples of numbers you’ll probably come across when making an adult sized hat. Finished Width * Gauge = Stitches Cast On. 1. You want a 22” hat at 4.5 st/in. How many sts do you cast on? 22in*4.5st/in = Stitches Cast On = 99. 2. You want to determine the stitch gauge for a finished hat. It had 72 stitches cast on and is 20 inches wide. Plug your numbers in the equation above. Gauge = 72/20 = 3.6 st/in. 3. 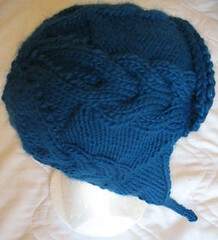 You want to calculate the width of a child’s sweater (or large headed adult–due to their big, big brains) using the Gauge and the Stitches Cast On. Gauge is 4st/in and you cast on 100 sts. Again plug the numbers into the equation as before. Solve for Width by dividing 100 by 4. 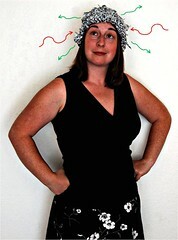 Once you have calculated the basic information on your hat you need to decide on how to work the decreases at the crown. Knitting is so forgiving it is okay to adjust the stitch counts to get a number that is evenly divisible. Typically hats use stitch counts that are divisible by 12, 11, or 10. That translates to *k10, k2tog*, *k9, k2tog* or *k8, k2tog* as your first decrease rows. Let’s say you want to make a 22 inch hat with a gauge of 4.5st/in. That gives a cast on of 99 stitches. But 99 isn’t divisible by 12, or 10. So what do you do? 99 is divisible by 11. That means after you knit about 6 inches from the cast on edge you’re ready to decrease. Well how do you know what to use on the first row? We already know that 11 goes into 99 without any leftover numbers, and that number is 9. So each decrease row will decrease the entire stitch count by 9. In order to get the right numbers the first decrease must include all 11 stitches and a k2tog. Subtract 2 (for the k2tog) from 11 and you have 9 plain knit stitches. Row 1 *k9, k2tog* around the entire row. Row 2 work a plain row of knitting. The next row is a bit easier. You just subtract 1 from 9 because there is one less stitch in other words before you had a grouping of 11 stitches after the decrease row that group of 11 became 10. And 10 – 2 for the k2tog is 8. Row 3 *k8, k2tog* with 81 stitches remaining. Now since we’re around 50 stitches you can decrease every row without the plain rows inbetween. Cut yarn and pull it through the last 9 stitches. Weave in the ends and you’re finished! And then we subtract 1 from each previous decrease row to account for the stitches that went away. Then as we discussed in the previous example you can decrease every row when you have about 50 stitches. The remaining rows are just like the ones above except the number of stitches remaining are different. Cut the wool and run through the remaining 12 stitches. Now you’re ready to work on your own! Let’s assume you have a hat that has 80 stitches cast on. Which number (10, 11 or 12) goes into 80 and using that what is your first decrease row? Finally, when you are using the first equation: Finished Width * Gauge = Stitches Cast On and you get a number that isn’t divisible by 10, 11, or 12 you can add or subtract stitches to make it work with those numbers. If you find a number that does not work with 10, 11 and 12 but it is evenly divisible (meaning no decimals) by your cast on stitches you should create your own decrease rows by subtracting 2 from the divisible number. Let’s use a cast on of 91 as an example. 91 is divisible by 13. And the first decrease row is *k11, k2tog* leaving 78 sts. Write out each decrease row. First calculate 91-13 to find the new stitch count, and subtract 13 from each subsequent decrease row until about 50 stitches remain. Then decrease every row until few enough stitches remain to bind off. Give it a try, you might be surprised to find out how easy it really is in the end! a MATH test? you are cruel, lady. cruel. There’s math in hats? That explains so much…. Yes there is a math test and Sue Sylvester will be caning all those will incorrect answers. So my usual technique of knitting what looks about right, ripping back, adding extra stitches, re-ripping back, cursing, knitting again with less stitches, finishing and then throwing knitted monstrosity into a dark cupboard and stomping outside for a smoke and a sulk is NOT the way to do it? Who knew?! I will get over my Math-fear and follow your calculations. Thank-you smart lady. I once made a beret using a doily pattern. Thank you so much for this info! I am a knitter, but can only knit what I find on Youtube! lol. Knitting instructions confuse the heck out of me. I started a baby hat with more stitches than I have done with adult hats(itty bitty needles) and wasn’t sure how to do the math to figure out the decrease. Your site definitely–finally– helped me figure it out. Thanks again.